ULSAN -- The southeastern city of Ulsan has long served as the backbone of South Korea’s industrial growth, and in its search of a new role in the era of the “fourth industrial revolution,” the city is betting big on hydrogen. Despite pervasive public indifference, the city -- home to South Korea’s heavy industry and car manufacturing businesses -- will take the lead in the development of hydrogen technology while promoting the use of hydrogen as a primary energy source for operating public transportation. And the city has a rather ambitious plan. By 2030, it plans to have 15 percent of personal vehicles as hydrogen cars and replace 40 percent of city buses, or 300 as fuel cell buses powered by hydrogen. The municipal office also plans to set up a total of 60 hydrogen refilling stations within the city in the next 12 years. 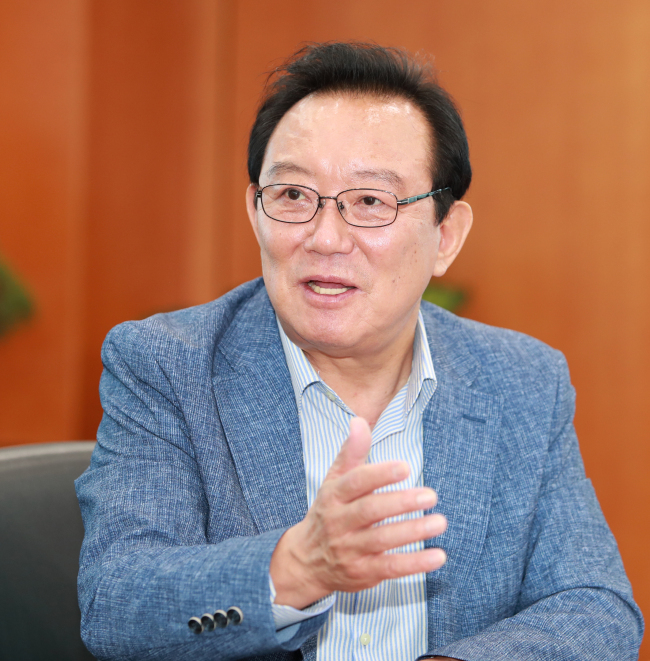 “We will do our best to turn Ulsan as the global mecca of the hydrogen industry by taking the advantage of being the world’s first manufacturing base of hydrogen cars, and our capacity of producing over 60 percent of hydrogen in South Korea,” said Ulsan Mayor Song Cheol-ho in an interview with The Korea Herald. A plan of building a hydrogen pilot town is under review, he added. “We are considering establishing an integrated renewable energy system, (where developers can test the efficiency of) fuel cell technology along with other renewable energy sources, such as solar power and thermal power,” he said. The mayor believes that hydrogen can be a practical solution to mitigate renewable energy intermittency. Electricity can be converted to hydrogen and hydrogen can be re-electrified by fuel cells. Taking a big step forward, Ulsan on Monday started a pilot operation of hydrogen buses, for the first time in South Korea. 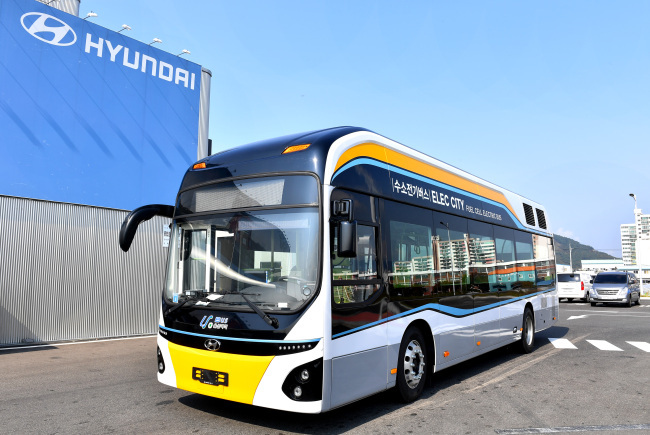 The zero-emission vehicle, developed by Hyundai Motor, will travel 112 kilometers a day, transporting city residents on the regular route of city bus No. 124. Along with Ulsan, other cities plan to adopt a total of 30 hydrogen powered buses next year. The plans are part of the central government’s hydrogen drive that aims to have 1,000 hydrogen buses by 2022 and more than 16,000 vehicles also powered by hydrogen. On the same day, Ulsan city government signed a memorandum of understanding with nine hydrogen related companies, including Hyundai Motor, to promote the growth of hydrogen economy. Hyundai Motor and its suppliers will invest more than 900 billion won ($797 million) to increase the size of the FCEV market to 30,000 units a year. The plan is expected to produce more than 2,200 new jobs, according to the government. Despite the rosy picture painted both by the central and municipal government, the public fear over the safety of hydrogen remain to be a hurdle for the growth of the new industry. It can lead to a massive disaster, but implementation of strict safety measures can prevent such tragic scenario, he said. “People think of the hydrogen bomb when encountering the word hydrogen at first. They don’t have proper understanding of hydrogen that the possibility of gas explosion is actually low,” he said. Even in the case of hydrogen leakage, the gas is lighter than oxygen and disperses quickly into the air -- four times faster than oxygen. Added to that are technological advancements in the hydrogen storage tank, made of carbon fiber capable of resisting twice higher the pressure of 700 bars, he said. The city’s hydrogen drive, however, is facing challenges in the prohibitive costs of establishing the hydrogen infrastructure. “It is nearly impossible to operate FCEVs and build hydrogen gas refilling stations without the government’s subsidies for now,” he said. “To continuously nurture the nation’s hydrogen industry, we need to prioritize technological innovation to make hydrogen economical and safe,” he added. Song is the first liberal politician elected as mayor of Ulsan, traditionally a conservative stronghold. The former human rights lawyer ran for mayor twice and for the National Assembly six times before he won the local election in July.